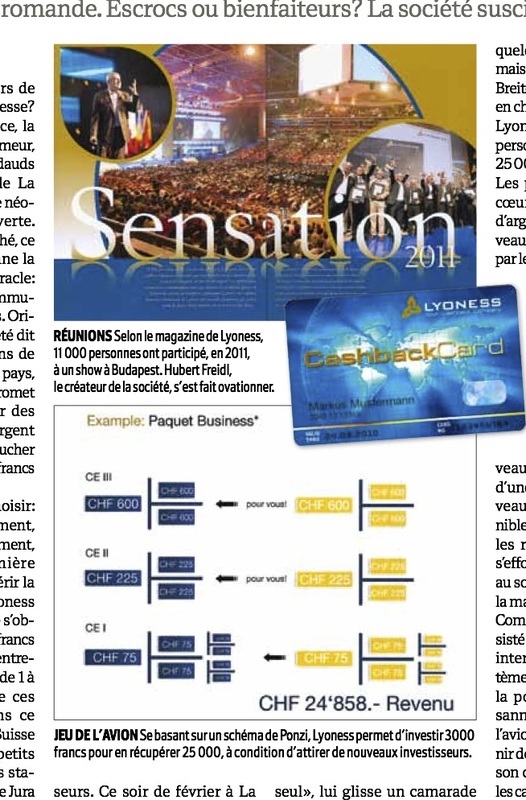 Lyoness, or Easy Money - Lyoness arnaque ou pas ? et Emrys La Carte ? Lyoness arnaque ou pas ? et Emrys La Carte ? Lyoness, a community of buyers in 23 countries, is developing in western Switzerland. Crooks or benefactors? The company stirs controversy. "Are you interested in earning thousands of francs? Join Lyoness." announces *Angelo, with an assured voice and a charming smile. The handful of onlookers, gathered at a hotel in La Chaux-de-Fonds, listens to this modern-day prophet open-mouthed. Armed with a polished PowerPoint, this thirty-something presenter gives the recipe for his miracle solution: join the Lyoness community of buyers. Native to Austria, the company claims to have attracted two million people in twenty-three countries, including 12,000 in Switzerland. It promises its members to get discounts, to recover money on their purchases, or to even earn tens of thousands of francs in cash. Members can choose: to make money slowly, quickly hit a jackpot, or both. The first method is to acquire a membership card that Lyoness says is free. In reality, it is obtained against the purchase of CHF 450 of gift vouchers in partner companies and offers 1% to 6% discounts from these brands. In this network, which is poorly developed in Western Switzerland, there are small traders, such as service stations Jubin in Jura or Boky, a Chinese restaurant in Lausanne. A robust approach is applied to converting people into business partners. By investing 3,000 francs in the company, members can withdraw 25,000, provided in turn they recruit a number of investors. That February night in La Chaux-de-Fonds, we will not know exactly how many, such is the apparent complexity of setting up the system. Presented in diagrams, Angelo is excited about the system’s miraculous formula. "It's very complicated," says Josiane*, a lady in her sixties. "No need to understand, it works by itself," interjects an associate of Angelo. "It's fantastic", she says finally. Too fantastic. Complaints of fraud are springing up everywhere, including in France, Austria and Switzerland. "Very often, people get a few hundred francs, but never more, said Eric Breiteneder, an Austrian lawyer in charge of more than 50 cases related to Lyoness. To our knowledge, nobody has got the famous 25,000 francs." The problems go back to the heart of the system. "The return of money from the entry of new investors reflects the principle of the Airplane Game," said Fabien Rouiller, a lawyer in the The Commission on Lotteries (Comlot). Also called a Ponzi scheme or pyramid selling, the system is based on the fact that profits are derived from recruiting new members, and not a sale. As long as new members are available, it works. Once the resources are exhausted, everything collapses, leaving those at the top of the pyramid with the most money. How has the company survived until today? "The law explicitly prohibits this system”, explains Yannick Buttet from the commercial enforcement authority in Valais. “But in addition to the Airplane Game, Lyoness can get discounts. The combination of the two confuses the issue. We are in the grey area. It's very clever." The Austrian Eric Breiteneder agrees: "To launch a trial is often more expensive than the amount invested, hence the longevity of Lyoness (founded in 2003, ed.)" The damage being caused by Lyoness exceeds the monetary losses, tearing apart families and friendships. "The group works on sponsorship”, attests Anne-Valérie Pinet, a French lawyer who represents the first complainant. “Members are trained by relatives, who are not wary of anything. But once the scam is revealed, the links break." From the outset of the proceedings, the lawyer and his client were subject to threats from the victim's relatives. Emotion is intensified because of the close relationships that are integral to Lyoness. "These people are fanatics or religious," says Eric Breiteneder. Rituals, a dress code to follow – wearing badges is obligatory - Lyoness regularly organises international meetings. "It sounds like a great mass," said the lawyer. Dance, song, it is a moment for worship. The founder and CEO of Lyoness, the Austrian Hubert Freidl, also engages in the show. Always present in the company's communications, the balding orator is the subject of boundless admiration. "This is our benefactor," said Angelo. Little information is known about the guru. His two partners, Tzvetan Streif and Hubert Wagner, come across as experts in casino games and chance. The three chair the mysterious Lyoness Child and Family Foundation. "This foundation is used to move money from one country to another. But nobody really knows where his money comes from and where it goes," said Eric Breiteneder. The international headquarters of the company is based in Buchs (SG) "for tax reasons," according to Angelo. But Eric Breiteneder emphasizes its other function: "All contracts of overseas members are signed with the Swiss entity. Swiss members sign a contract with the Austrian group. The reason: they seek to complicate legislative procedures in the event of a trial. "A Swiss firm has received a complaint from former employees of the firm who would have had access to documents proving the fraudulent activities of Lyoness." Today, the law does not allow the Swiss authorities to actively fight against the company. But the State Secretariat for Economic Affairs [SECO] will soon be able to get involved," says Fabien Rouiller of Comlot. From 1st April, the change in competition law will provide SECO with new legal powers, which will finally allow it to seize the files. When contacted by L'Hebdo, SECO said it could not rule before the new law comes into force. But the lawyer in charge of the Swiss case revealed: "Lyoness is frightened, and is seeking to move its headquarters to Luxembourg before the deadline." Lyoness was contacted several times at its bases in Switzerland and Austria, but refused to respond to our questions. * Names have been changed.